2014 UCI Worlds: I Did It! With enough time in hand to celebrate his surprise victory, Michal Kwiatkowski, made a meal of it. First clasping his face in disbelief, then swinging his arms wide in victory. He crossed the line reaching down to kiss the Polish flag emblazoned upon his jersey. He was chased all the way to the line, with Simon Gerrans (Australia) claiming the silver and Alejandro Valverde (Spain) grabbing bronze for the second year running. While Kwiatkowski is new to the Worlds, Valverde has been on the podium seven times now, just never on the top step. Just slipping into fourth place was the Danish rider, Matti Breschel, who had started the attacks that led this group to the line almost together. This is a small original watercolor and ink painting that is available through my artist website, www.greigleach.com. To purchase this particular painting, just follow the direct link at the end of this post. 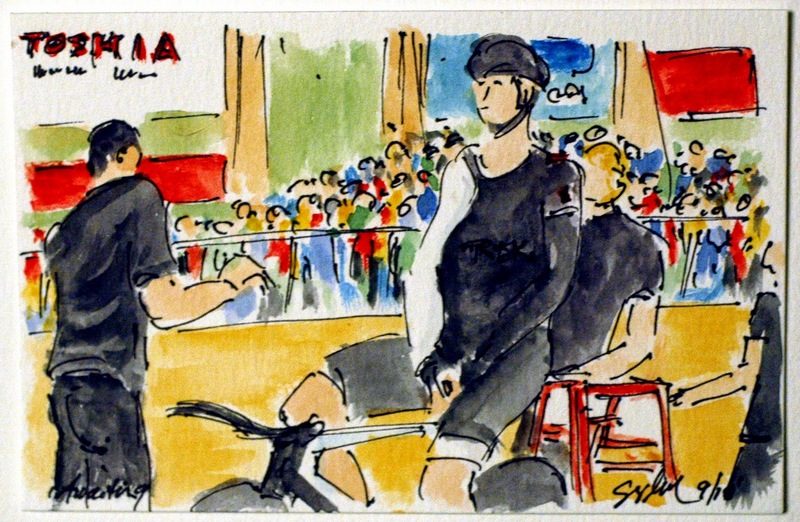 2014 UCI Worlds: I Can Do This! As he looked back over his shoulder with just over a kilometer to go this time, he could see a small group closing in. And the peloton not far behind them. 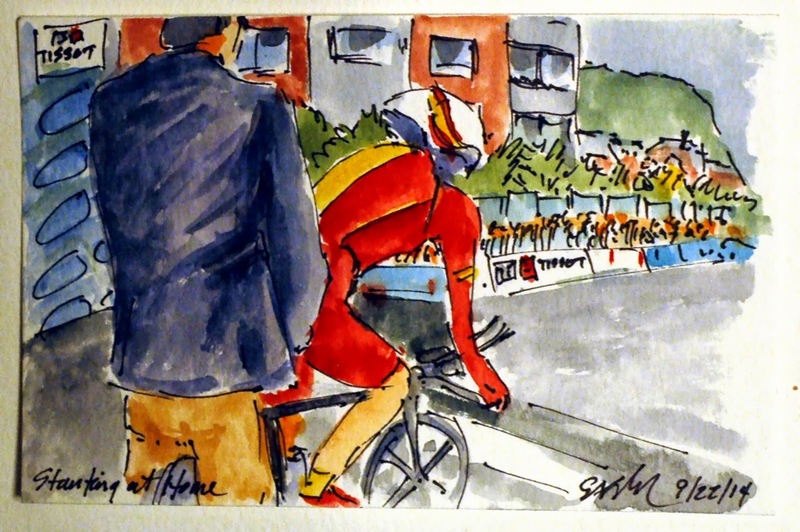 He saw that former World Champion, Philippe Gilbert (Belgium) was leading, Cyril Gautier (France) and the two Spaniards, Roaquim Rodriquez and Alejandro Valverde, back towards his wheel. 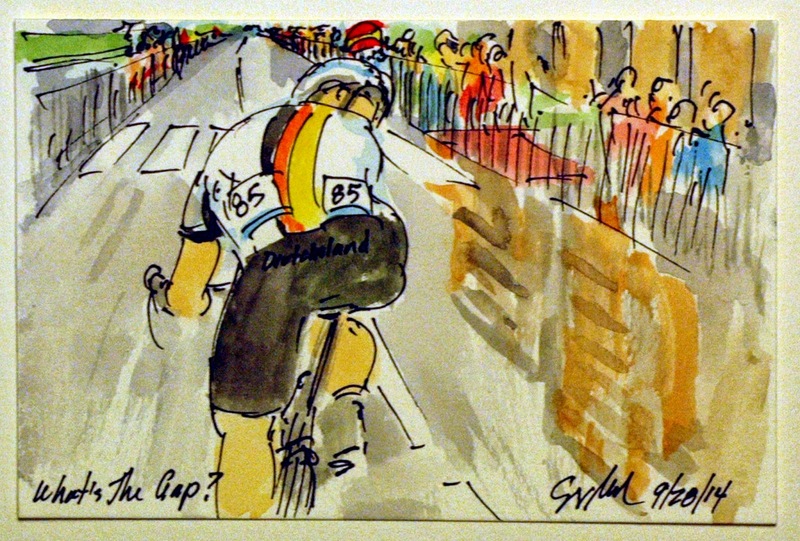 With just about another 4 or 5 minutes of effort, Michal Kwiatkowski (Poland), must have been thinking, "I can do this!" This is a small original watercolor and ink painting that is available through my artist website at www.greigleach.com. To purchase this particular painting, just follow the direct link at the end of this post. Michal Kwiatkowski (Poland) put in a vicious attack on the penultimate climb of the day, quickly dropping all of the top riders in the world. Peeking behind as he passed under the 5 kilometer to go banner, I am sure he was both surprised and delighted to see no one in sight. 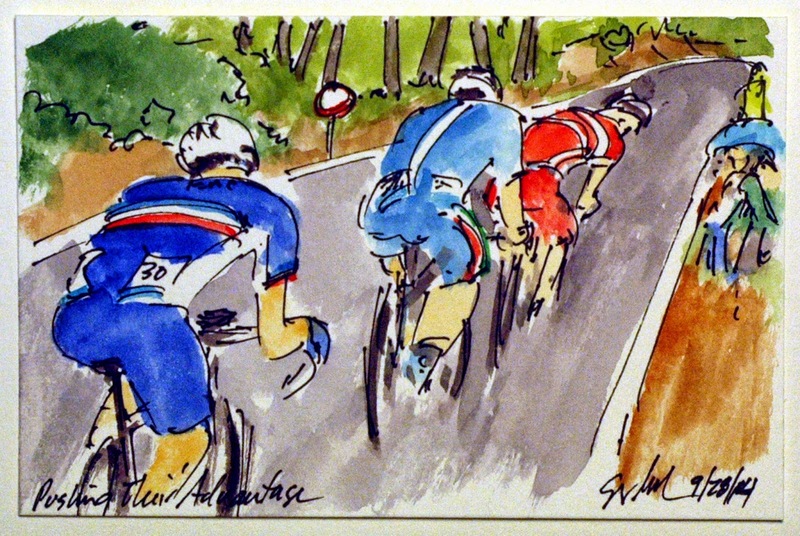 While he didn't have much of an advantage, the bend in the road blocked the chasers from view heartening the young man from Poland. Kwiatkowski is having a hell of a year wearing the White Jersey in the 101st Tour de France on multiple stages and now here he is off the front of the peloton with just five kilometers to a Rainbow Jersey. This is a small watercolor and ink painting that is available through my artist website at www.greigleach.com. If you would like to purchase this particular painting, just follow the direct link at the end of this post. 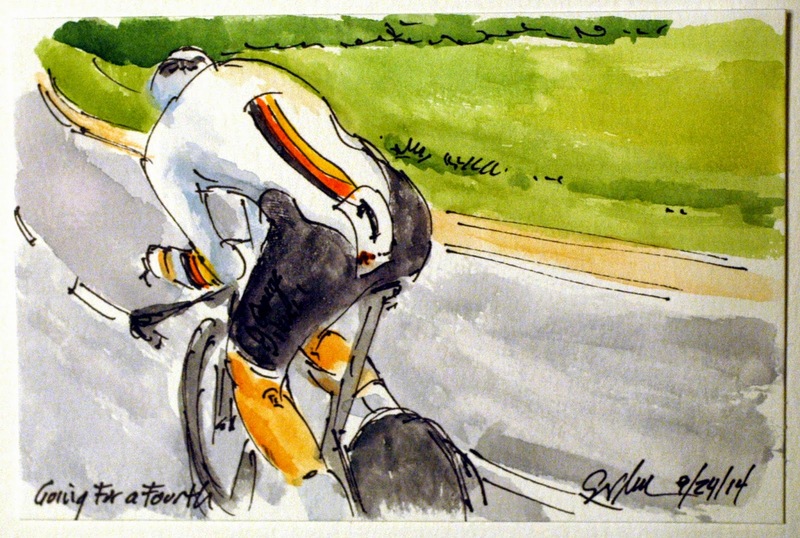 You can see more art and read more about Kwiatkowski in my soon to be released, "Book de Tour." It is available through my website as well, just look for the "Gallery" Book de Tour. Just as in the professional teams, the national teams have both domestiques and designated team leaders, leaders who ride as protected riders. Ion Izagirre (Spain) riding for the "home team", went to the front to chase down the breakaway for his teammates, Alejandro Valverde (who rides with him on the Movistar squad) and Joaquim Rodriquez. Benefiting from his efforts, tucked in behind the strong man from the Basque countryside, were this year's winner of the Tour de France, Vincenzo Nibali (Italy) and the climbing sprinter, John Degenkolb (Germany). This is a small original watercolor and ink painting that is available through my artist website at www.greigleach.com. To purchase this particular painting, just follow the direct link at the end of this post. While you are there, why not take the time to browse all of the art that is on offer? Remember, international shipping is available. With Tony Martin (Germany) pulled back into the fold, it was time for this year's king of the breakaway, Alessandro De Marchi (Italy) to toss his hat into the ring. Or perhaps his wheel into the wind? De Marchi was quickly joined in the effort on the penultimate trip up the steep final climb on the 18 kilometer lap by Cyril Gautier (France) and Matti Breschel (Denmark). The trio presented a serious threat to the peloton that was scrambling behind to get the chase organized. This is a small original watercolor and ink painting that is available through my artist website at www.greigleach.com. To purchase this particular painting, just follow the direct link at the end of this post. While you are there, be sure to check out my soon to be released, "Book de Tour." 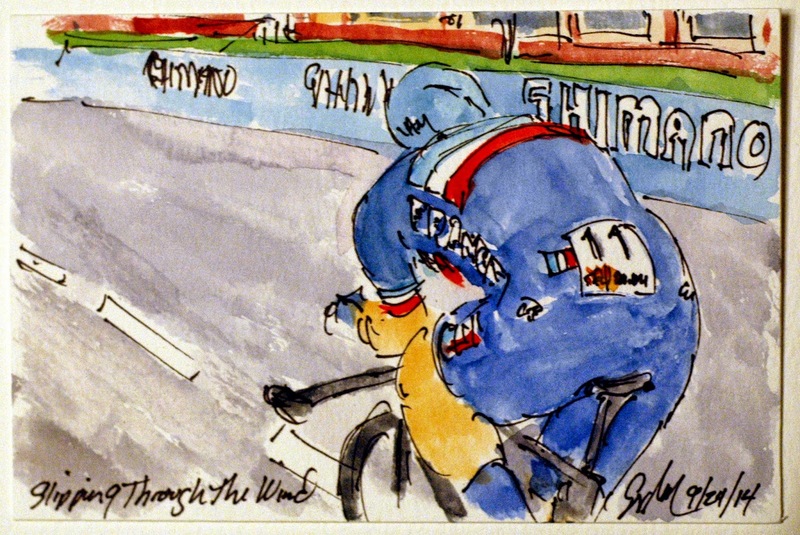 It is a collection of my paintings and writings of the 101st Tour de France, a race and a book were De Marchi is well represented. 2014 UCI Worlds: What's the Gap? Tony Martin (Germany) fresh from his disappointment in the Men's Elite Time Trial - he only managed to finish second - decided to be the next one to attack the peloton. With his pedigree riding on his own, he has the legs and the skill to make his attack stick, and I am sure he would willingly trade his Time Trial Rainbow for a Road Racing one. However, I am sure there are many who want the same honor, including others riding for Germany today. So while he is peering behind to see just how much time he has put into the rest. This is a small original watercolor and ink painting that is available through my artist website at www.greigleach.com. To purchase this particular painting, just follow the direct link at the end of this post. While you are there, be sure to check out my soon to be released "Book de Tour." 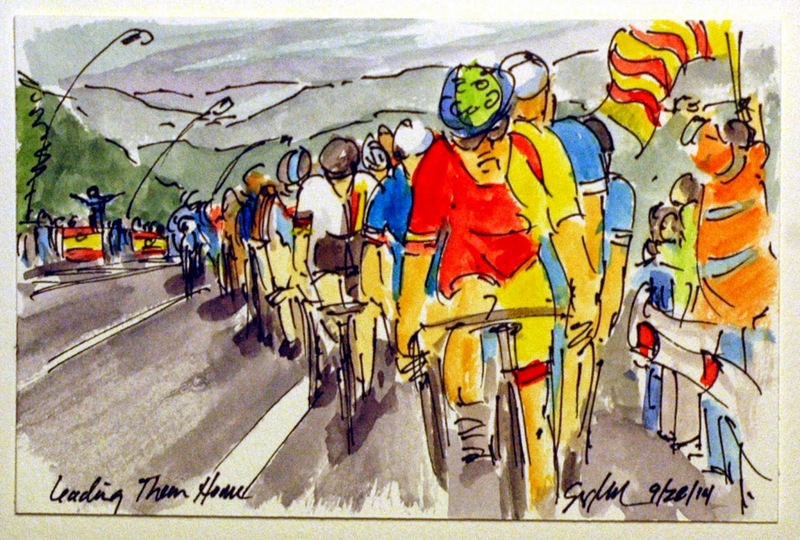 It is a collection of my paintings and post of the 101st Tour de France, obviously, Tony Martin figures prominently on the 240 pages therein. 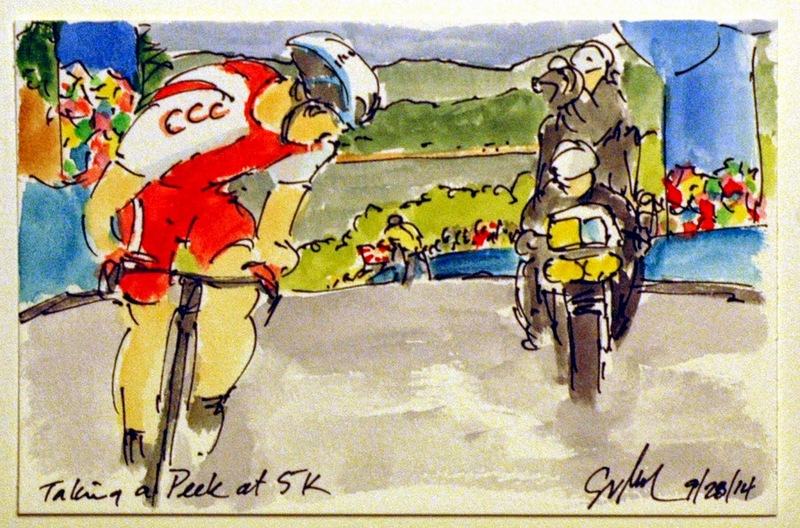 Once the early breakaway had been caught by the enlivened peloton, it was the hills and the rain that combined to splinter the pack. That and the aggressive riding of Peter Kennaugh (United Kingdom) and Giovanni Visconti (Italy). The pair decided it was time to open up the race, perhaps establish a break for their team leaders to bridge up to. This is a small original art painting that is available through my artist website at www.greigleach.com. To purchase this particular painting, just follow the direct link at the end of this post. While you are there be sure to check out my soon to be release book of the 2014 Tour de France, "Book de Tour." 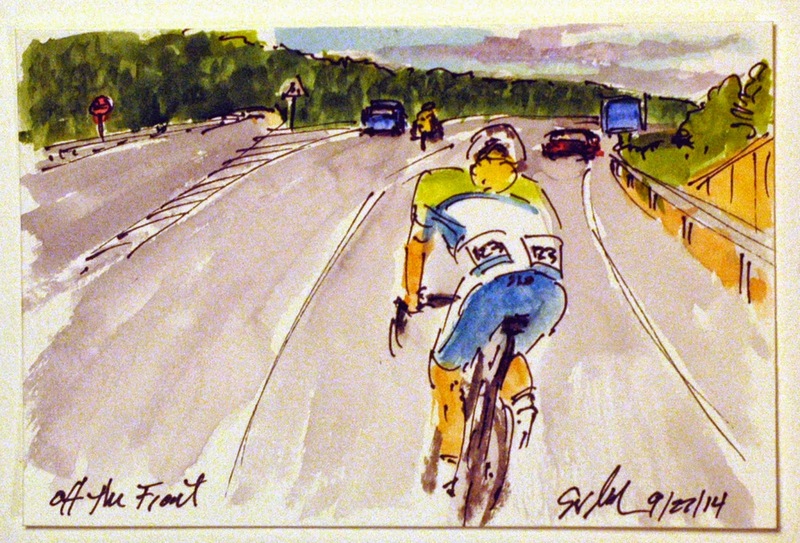 Visconti is one of the many riders in today's peloton that feature prominently in the book. The Elite Men's Road Race marks the completion of the UCI World Road Racing Championships and the seventh day of races. With 14 laps of the 18.2 kilometer course, the men were facing a long day in the saddle covering 154 kilometers in roughly six and a half hours. The first break away of the day was able to build up a fifteen minute advantage on the peloton. A peloton that didn't feel like taking risks early on the rain soaked roads of north western Spain. The early group contained C.J. Quintero (Colombia), M Kvasina (Croatia), O. Polivoda (Ukraine) and Z. Savicka (Lithuania). While the foursome was hopeful, there was little chance that the big names of the sport would let them steel the day or the Rainbow Jersey. This is a small original watercolor and ink painting that was created using Yarka St. Petersburg watercolors and Steve Quiller brushes from Jack Richeson and Company, www.richesonart.com. 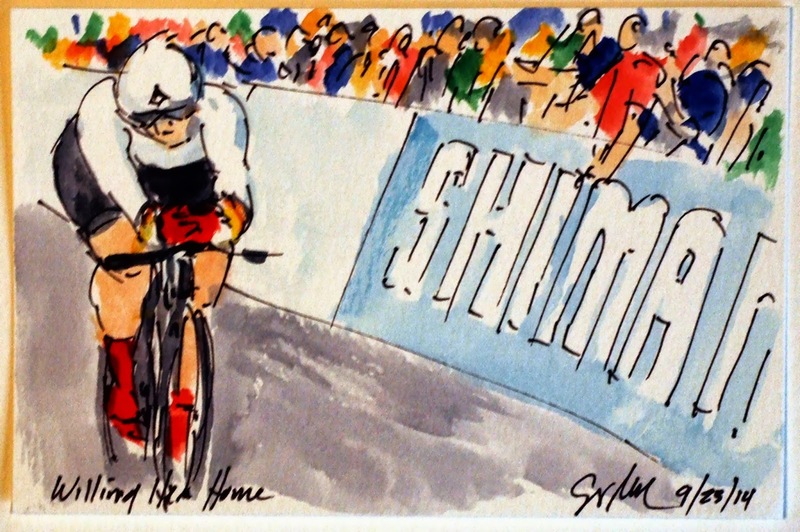 The painting, and all of my works from the UCI Worlds, are available through my artist website at www.greigleach.com. To purchase this particular painting, just follow the direct link at the end of this post. But while you are there, why not take the time to browse all of the art on offer? International shipping is available. 2014 UCI Worlds: Can You Confirm? At the top of the final climb a group of favorites got away. Marianne Vos, Emma Johannson, Lizzie Armstead and Lisa Brennauer, had gotten the gap that they needed to contest for the Rainbow Jersey and the other two steps for the podium. However as the quartet got inside the final kilometer, they began to slow each not wanting to be on the front of the group (a position that is very difficult to win from). As they wove back and forth across the road and hard charging group of 10 riders driven by two women from the German team tagged onto the leading group, I was left wondering why they had let the others back into the race. I have seen this far to many times in the professional peloton. The four had a seventy five percent chance of landing on the podium, with the gamesmanship, none finish even in the top five. With so many coming to the line together, it wasn't clear who had taken the victory. The UCI will lay a hand on the winner of every race, taking them directly to drug testing (just to insure they have raced clean). 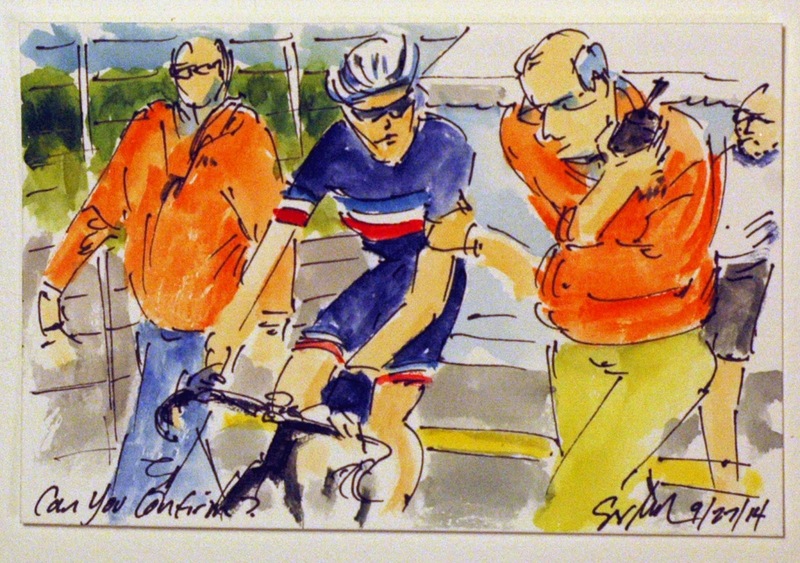 Here the shepherds of Pauline Ferrnad-Prevot (France) used their radio to confirm that she is indeed the new Women's Road Racing World Champion. Chapeau, Pauline! This is a small original watercolor and ink painting that is available through my artist website at www.greigleach.com. To purchase this particular painting (only $50 USD), just follow the direct link at the end of this post. International shipping is available. 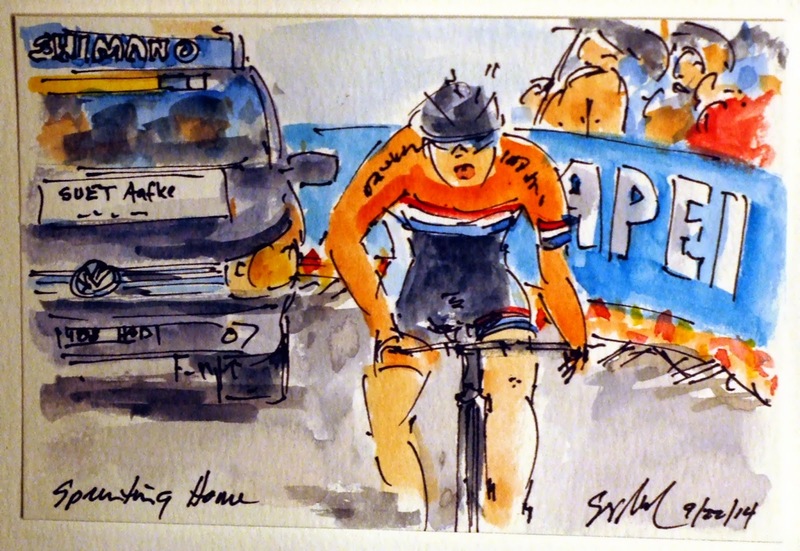 Everyone had been waiting for the attacks to come, but it was not until the final climb of the Women's Elite Road Race did the aggression really come out. The first to put in a serious attack was American Evelyn Stevens who had already claimed the bronze medal in the Elite Women's Time Trial. Given her pedigree, Marianne Vos (Netherlands) and Lizzie Armistead (United Kingdom) were not about to let the American slip off the front. The fourth rider in the line is Lisa Brennauer of Germany followed by the rest of the favorites to claim the Rainbow at the line. This is a small watercolor and ink painting that is available through my artist website at www.greigleach.com. To purchase this particular painting, just follow the direct link at the end of this post. It was a reduced peloton that came to the penultimate climb, but all of the favorites were there. 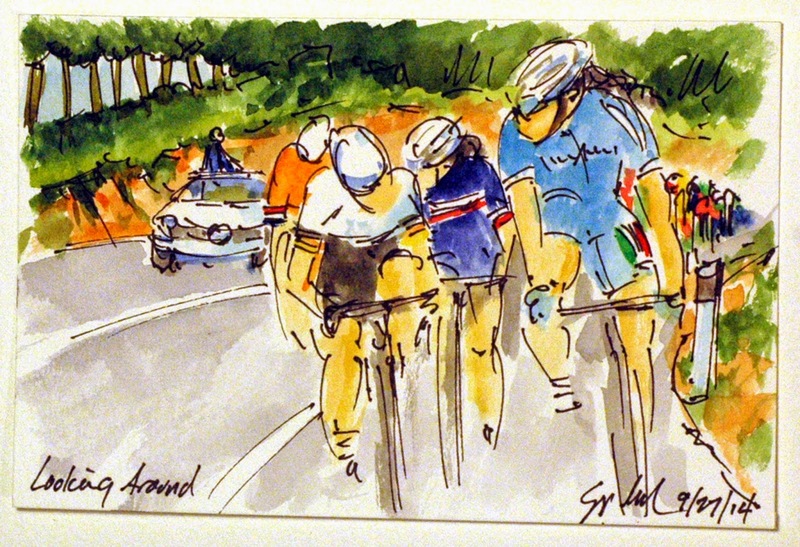 At this point it is Giorgia Bronzini (Italy) on the front, looking around to see that Lisa Brennauer (Germany), Pauline Ferrand-Prevot (France) and Marianne Vos (Netherlands) have all latched onto her wheel. Even the race director has popped up through the sun roof of the referee's car to get a better view of the start of the action on the bell lap. This is a small original watercolor and ink painting that is available through my artist website at www.greigleach.com. To purchase this particular painting, just follow the direct link at the end of this post. While you are there, why not take the time to browse all of the artwork on offer. International shipping is available. 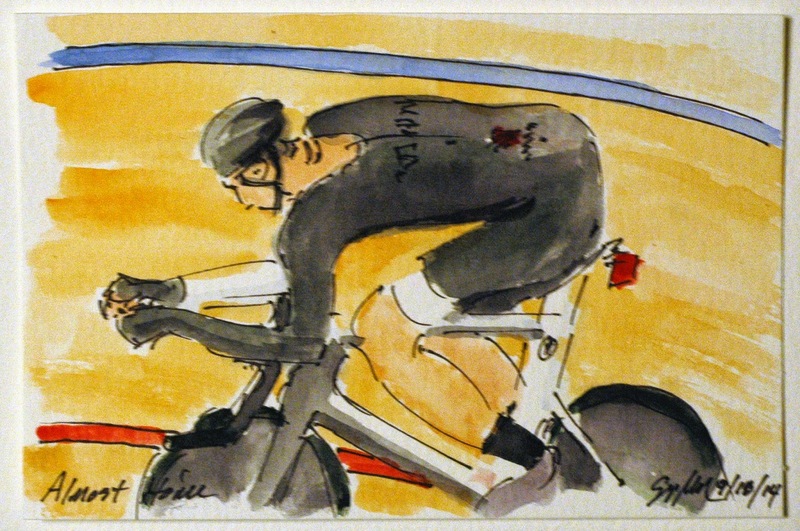 Showing the evidence of having hit the ground in the big crash, American Alison Powers, put in a hard solo attack. She most likely was hoping to establish a small group off the front that her teammates could later use as a bridge to gain time on the big rivals. On each lap of the course in Ponferrada, the rides had an area were their team soigeurs could hand their riders bottles, gels and food. It takes some skill to hand sustenance to a cyclist moving at 30 to 40 kilometers per hour. This is a small original watercolor and ink painting that is available through my artist website at www.greigleach.com. To purchase this particular painting, just follow the direct link at the end of this post. 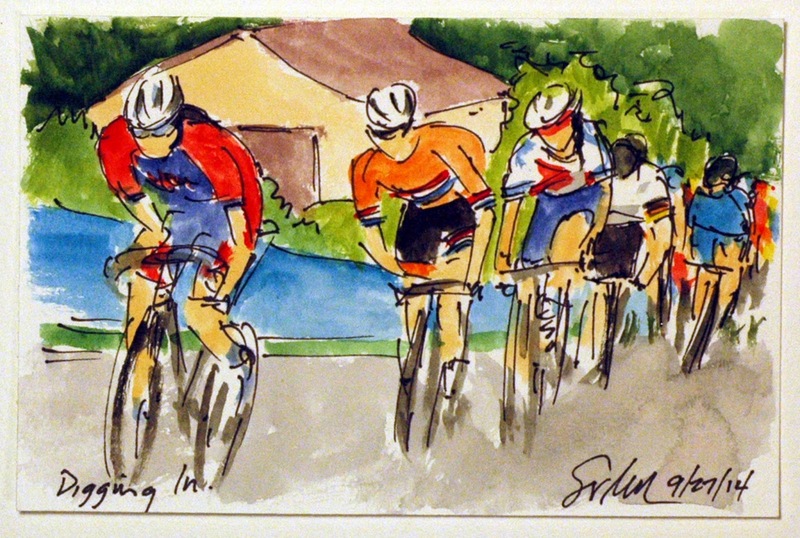 Once the peloton had pulled back the Slovenian, Spela Kern, the women dropped into riding tempo. The course of seven laps included to sharp climbs that weren't too hard on the first trip up, but as the day wore on, the hills seemed to get steeper and steeper. The Dutch team in their distinctive bright orange jersey, had the two consecutive time defender of the Rainbow Jersey, Marianne Vos. 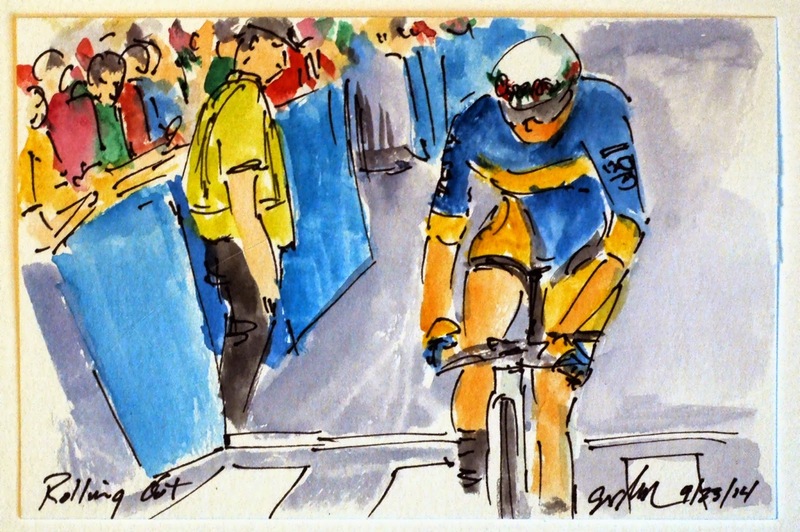 Because she has been so dominate, having won the silver medal at the preceding 6 consecutive Worlds, it was up to her team to do the work on the front of the peloton. Team USA was ever attentive, their team leader, Shelly Olds, as been locking horns (or handlebars) with Vos all season long and the team felt she had the form to get around the Dutch star. This is a small original watercolor and ink painting that is available for purchase through my artist website, www.greigleach.com. To purchase this particular painting, just follow the direct link at the end of this post. While you are there, take the time to check out my soon to be released, "Book de Tour". 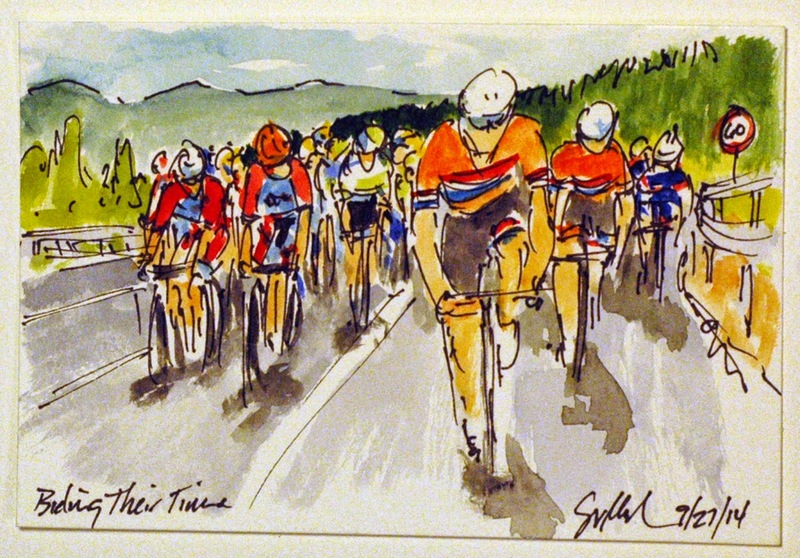 The book is my collection of paintings and blog post of the 101st Tour de France, along with La Course by Le Tour. While on the second lap of the 127.4 kilometer course there was a huge pile up started by a single touch of wheels. It ended with easily thirty women going to the asphalt, the ditches and into tangled piles of limps, wheels and frames. 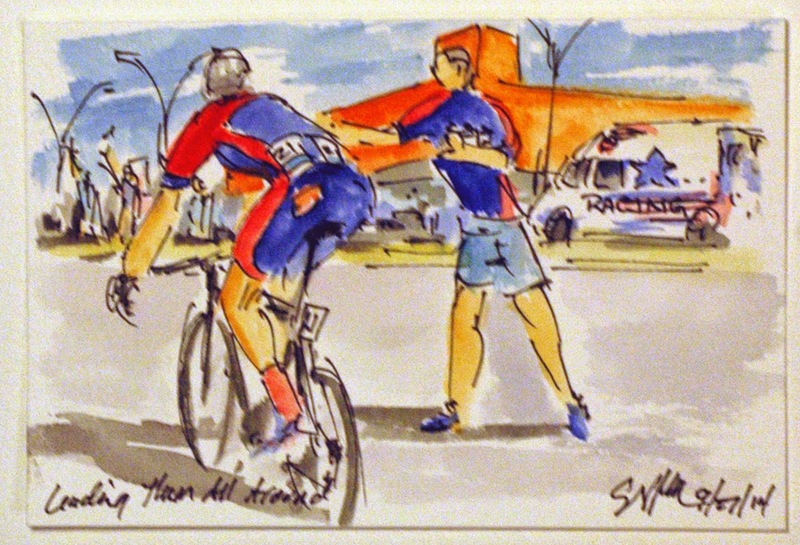 As they got back underway, it was a slow moving peloton that was trying to figure who was there and who had climbed off their bikes and into a waiting ambulance. The Slovenian rider, Spela Kern, decided that the pace was way too slow and it was time to attack the group. With nearly 60 kilometers left to race, it was a very long shot that she would be able to stay away to the line. This is a small original watercolor and ink painting that was created using Yarka St. Petersburg watercolors and Steve Quiller brushes from www.richesonart.com. The painting is available through my artist website at www.greigleach.com. To purchase this particular painting, just follow the direct link at the end of this post. Bradley Wiggins, winner of the 2012 Tour de France, has been reclaiming his fire ever since he was left out of the nine teammates that went to this year's Tour. Team Sky may well have regretted the decision once Chris Froome crashed out. But it was the spark that has re-ignited the fire in the belly of the reigning gold medalist in the Olympic Time Trial. Wiggins started the Men's Elite Time Trial two minutes ahead of his main rival, Tony Martin, but quickly started stretching that gap out second by second as the two put all of the efforts into going as fast as possible. 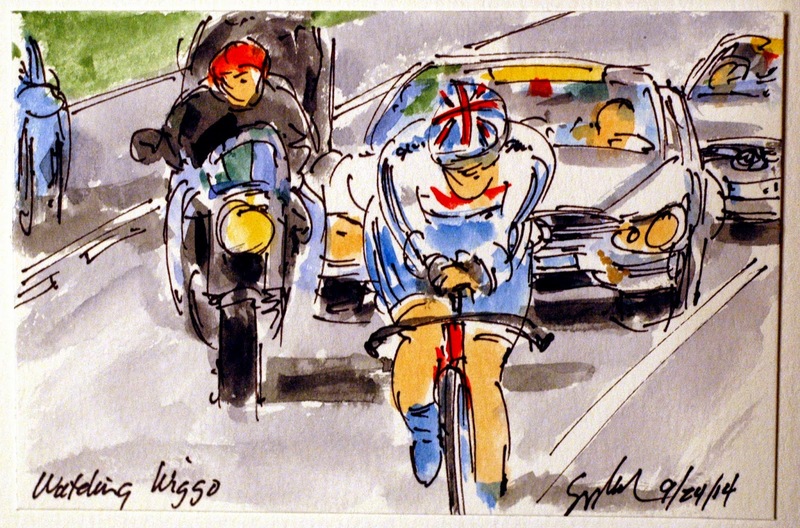 By the end of the race, Wiggins had gained twenty-six seconds on the now former World Champion. Sir Bradley Wiggins can now add a Rainbow Jersey to his Olympic Gold Metal and his Tour de France Yellow Jersey. This is a small original watercolor and ink painting that is available through my artist website, www.greigleach.com. To purchase this particular painting, just follow the direct link at the end of this post. Tony Martin rolled down the start ramp and out on the course around Ponferrada, Spain, in search of a record breaking fourth consecutive World Time Trial Championship. Martin of Germany, has an incredible record in the Worlds and in German, as well as the ProTour calendar. This year he won the only time trial in the Tour de France, but also claimed his first road race stage victory in his career in the same Tour. Wearing race bib number one, he was the last to head around the 29.5 kilometer course. An advantage as he will know the split times of everyone on the road ahead of him. He would always know if his efforts were enough, but he had some very stiff competition just two minutes up the road. This is a small original watercolor and ink painting that is available through my artist website at www.greigleach.com. To purchase this particular painting, just follow the direct link at the end of this post. While you are there, why not take the time to look around at all of the artwork on offer? The Time Trial, or the Race of Truth, is all about the individual's ability to slip through the wind with the least amount of drag possible. 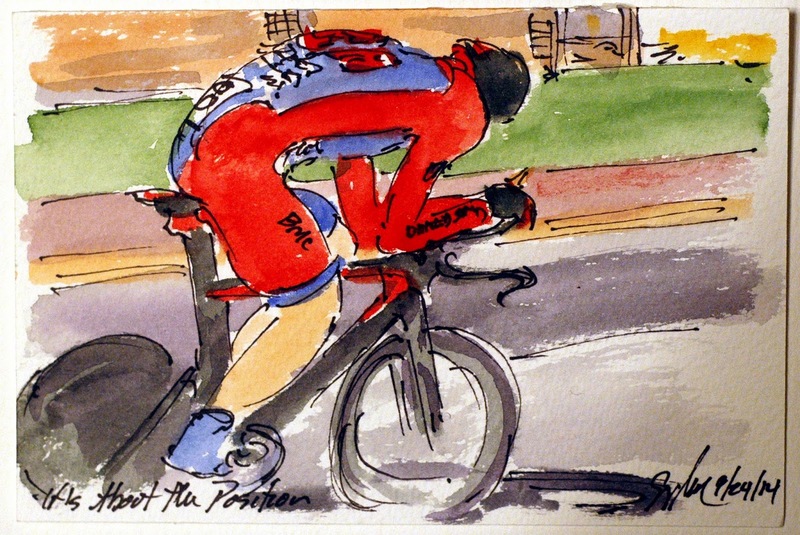 To that end, Tejay van Garderen, drops into his aerodynamic tuck, with his arms as close together as possible, the head down and the back arched all to present as little of his body to the wind. The bikes are designed with the same basic purpose. However, neither the bike nor the position of the rider astride the machine, are about control or agility, they are only about speed. This is a small original watercolor and ink painting that is available through my artist website at www.greigleach.com. To purchase this particular painting just follow the direct link at the end of this post. 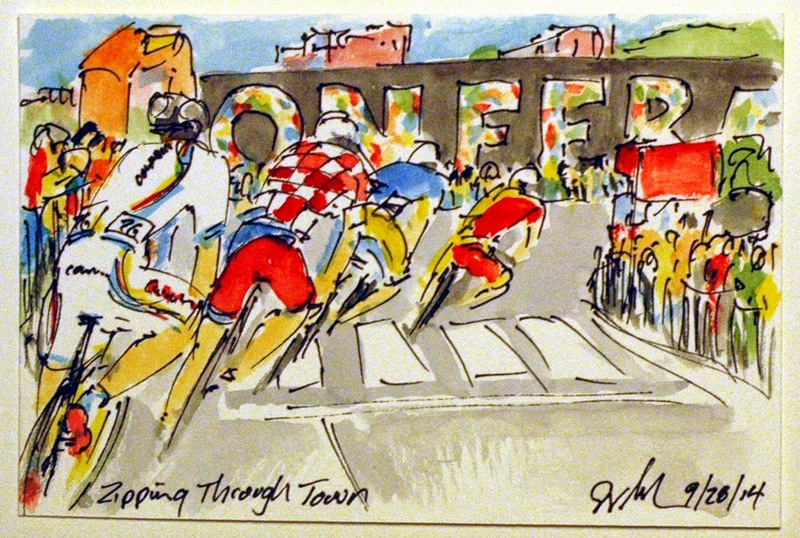 Be sure to check out my soon to be released book of annotated art of the 101st Tour de France, "Book de Tour". It is available for pre-order and international shipping is available. Sylvain Chavanel is the three time Time Trial Champion of France, but has yet to win in the Worlds. While we have grown use to seeing him in his tricolore national kit, at the worlds no one wears a championship jersey while racing. Instead they will where their national colors, but in a team uniform that every racer will don on race day. This is a small original watercolor and ink painting that is available through my artist website at www.greigleach.com. To purchase this particular painting just follow the direct link at the end of this post. 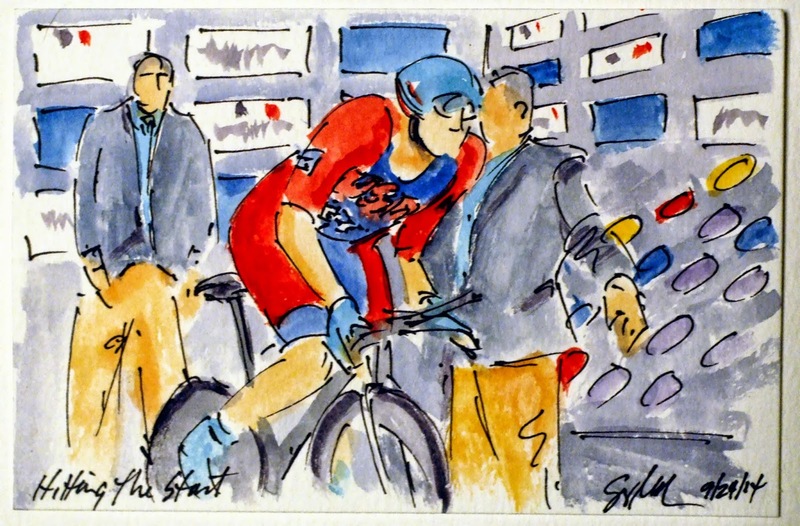 While you are at the website, you can pre-order my book of paintings of the 2014 Tour de France, "Book de Tour". International shipping is available for both the paintings and the book. 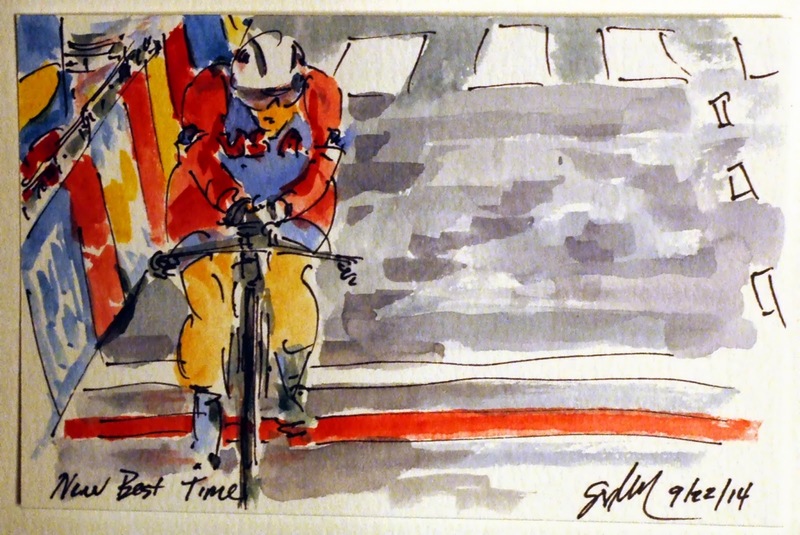 The United States brought a really strong team to Ponferrada, Spain in hopes of going home with a Rainbow Jersey. Perhaps with Fabian Cancellara choosing not to ride in the Men's Elite Time Trial there was a chance, but they would have to get past the three time World Champion, Tony Martin. And Martin would be the last to roll down the start ramp today. Andrew Talansky rolled down the start ramp roughly mid way through the start order, looking for the form that enable him to win the Criterium du Daphine earlier in the season. This is an original small watercolor and ink painting that was created using Yarka St. Petersburg watercolors and Steve Quiller brushes from www.richesonart.com. The painting is available through my artist website at www.greigleach.com. To purchase this particular painting just follow the direct link at the end of this post. 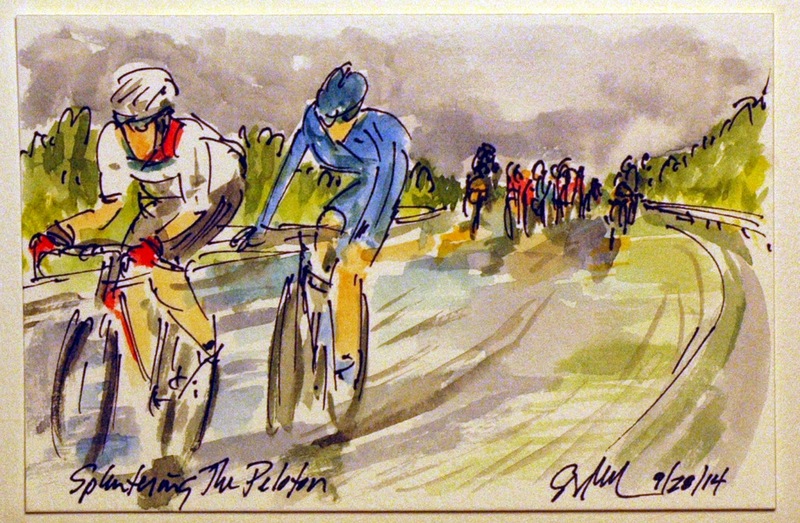 But while you are there, why not take the time to look at all of the cycling art on offer? To quote Phil Liggett as Lisa Brennauer of Germany headed up the final 100 meters of the course, "The crowd is willing her home." The German's ride was just fast enough to nip in ahead of the Ukrainian, Anna Solovey, and claim gold for the Elite Women's Individual Time Trial. She now will have the honor of wearing the Rainbow Jersey of World Champion every time she lines up to race an individual time trial. She will have that honor until the Championships come to Richmond, Virginia in the United States in 2015. Today is her second Gold Medal of these races, she was part of the Shimano - Lulu Lemon squad that won the Women's Team Time Trial early in the week. This is a small original watercolor and ink painting that is available through my artist website at www.greigleach.com. To purchase this particular painting, just follow the direct link at the end of this post. While you are there you can pre-order my 2014 Tour de France book, Book de Tour, which includes Brennauer's 4th place finishes in La Course, raced on the finally day of the Tour in Paris. The American, Evelyn Stevens, hit the 29.5 kilometer time trial course fast and hard. She went through each of the time checks including the one at the finishing line just behind the Ukrainian, Anna Solovey. Her ride was good enough for silver when she crossed the line, but with a couple more women still out on course, it was uncertain if she would be on the podium at the end of the day. This is a small original watercolor and ink painting that is available through my artist website at www.greigleach.com. To purchase this particular painting, just follow the direct link at the end of this post. 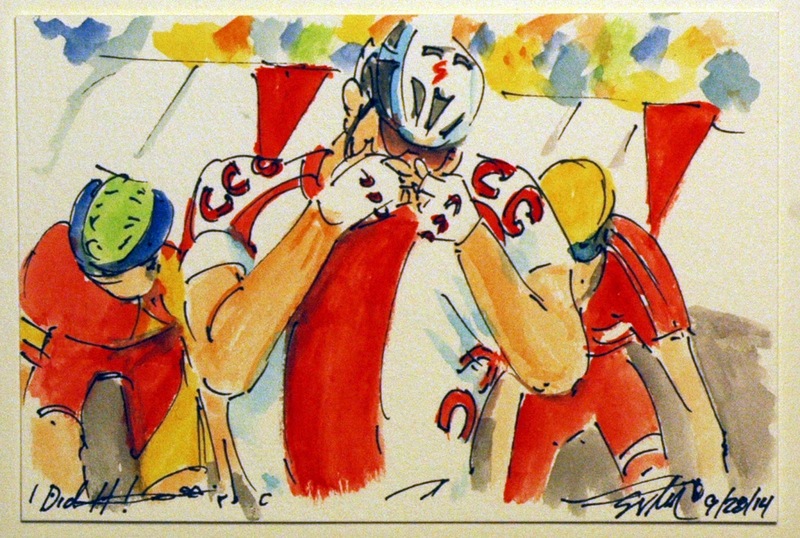 But you really should take the time to browse all of the cycling art on the site. Plus you can pre-order my book of the 2014 Tour de France, Book de Tour, from the site as well. The Elite Women rolled down the time trial start ramp today in Ponferrada, Spain, searching for a Rainbow Jersey at the end of their solo effort against the clock. Anna Solovey of Ukraine was out on a fast ride around the outskirts of the city before swinging back towards town. She was first at each of the time checks along the route and logged the fastest time across the line when she finished. 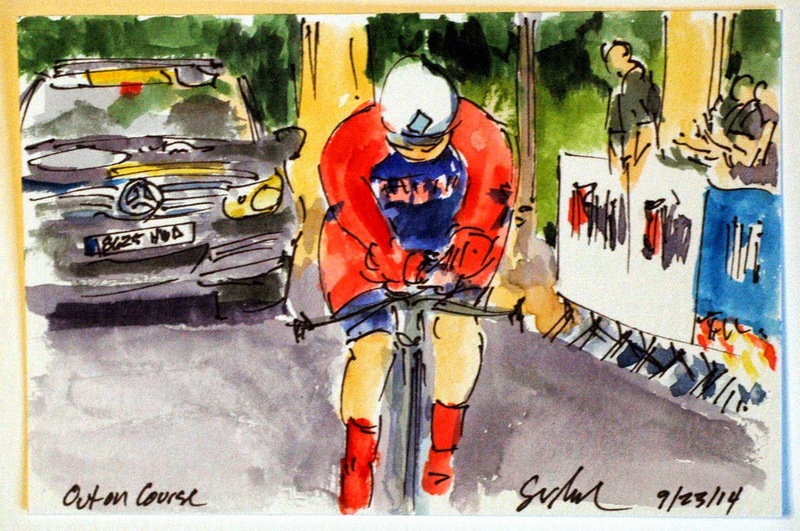 However, with a time trial, no rider knows their ultimate placing until the final rider has finished her effort. 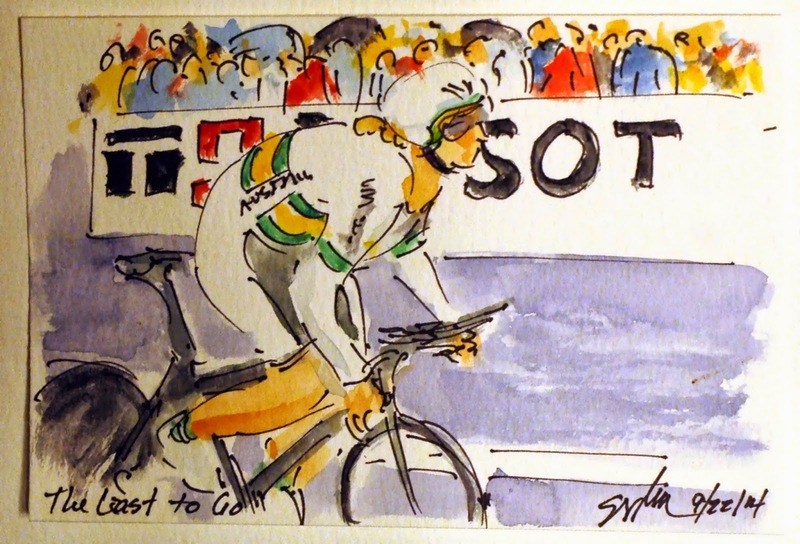 All Solovey could do was sit in the throne in the club house waiting to see if she would be forced to give up her seat and her dream of the coveted Rainbow Jersey of Women's World Time Trial Champion. This is a small original watercolor and ink painting that was created using Yarka St. Petersburg watercolors and Steve Quiller brushes from Jack Richeson and Company, www.richesonart.com. The painting is also available through my artist website at www.greigleach.com. To purchase this particular work, just follow the direct link at the end of this post. 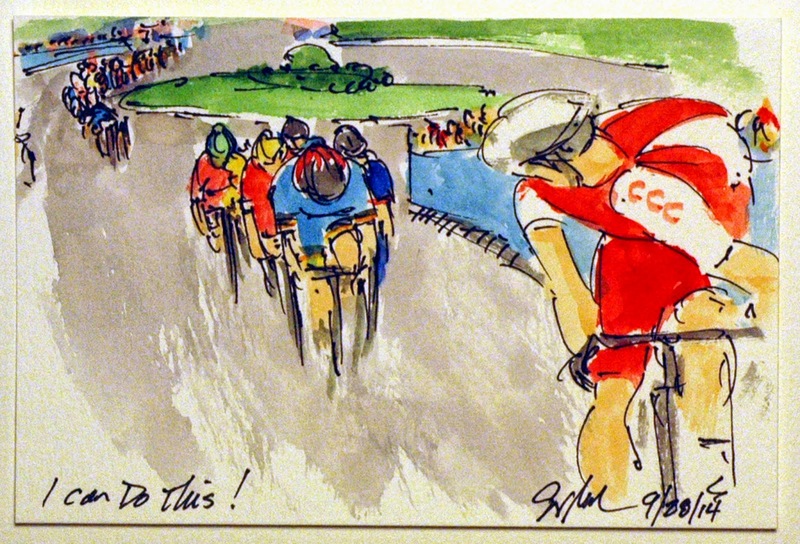 But while you are there, why not take the time to browse all of the cycling art on offer? Like all of the competitors in a time trial, Aafke Suet of the Netherlands, could see her time as compared against those on the leader board as she approached the line. She stood on the pedals sprinting as hard as she could in hopes of toppling those who currently occupied the podium slots. While she did all she could, she was only able to cross the line, mouth agape, with the fifth best time on the day. With her finish, the Australians finished with two riders in the top three for the third year in a row in the Under 23 Women's Time Trial, however this year, the top of the podium was theirs! This is a small original watercolor and ink painting that is available through my artist website at www.greigleach.com. To purchase this particular painting just follow the direct link at the end of this post. With the Women's Under 23 Time Trial race coming to a close, it was the Australian, Alexandra Manly, who had the honor of being the last to roll down the start ramp in Ponferrada, Spain. As she stomped on her pedals, she knew that two of her teammates were currently holding first and third at the finishing line. Manly had reason to dream of donning the Rainbow Jersey at the end of the day. She managed to finish third overall last year in Italy and the two who had finished ahead of her had aged out of the Under 23 category. Unfortunately, it was not to be her day, perhaps it was the rain that had continued to worsen as the day's racing progressed. So while it was an honor to start last, it was a distinct disadvantage. She could comfort herself in the knowledge that her country women held their placings. This is a small original watercolor and ink painting that is available through my artist website at www.greigleach.com. To purchase this particular painting, just follow the direct link at the end of this post. 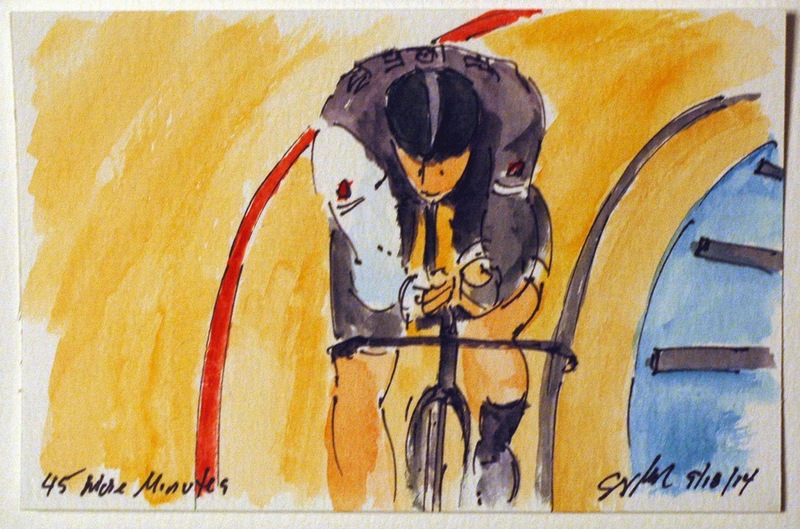 All of my cycling paintings are done in as close to real time as possible, without knowledge of the final results. That being said I was excited when Emma White, riding for the United States, was able to post the new best time with only roughly a quarter of the field of women yet to cross the line. 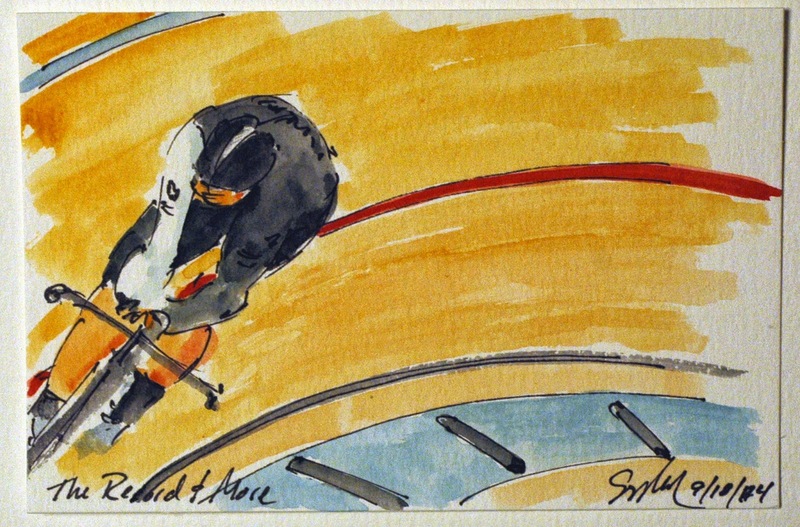 In any time trial, the rider holding the fastest time over the course will sit in the 'throne' of race leader until either their winning time is confirmed or they have to surrender the chair to the rider who has cover the course in less time. White was able to hold the chair for some time before the Australian who claimed the overall booted her out of her chair. Actually the Aussie, Macey Stewart, was quite polite in her victory. This is an original watercolor and ink painting that is available through my artist website at www.greigleach.com. To purchase this particular painting, just follow the direct link at the end of this post. With the Elite men's and women's team time trials over and done, it was the time for the individual time trialist to take the stage in Ponferrada, Spain. The morning roads were given over to the Junior Women's Time Trial for those under the age of 23. One of the early riders to start down the ramp for just over twenty minutes of all out effort was one for the home team, Maria Calderon of Spain. Without a general classification to set the order of starters, the UCI started those they expect to post slower times first ending with the rider highest place in 2013 still eligible to race in the category. This is an original small watercolor and ink painting that was created using Yarka St. Petersburg watercolors and Steve Quiller brushes from Jack Richeson & Company, www.richesonart.com. In addition the painting is available through my artist website at www.greigleach.com. To purchase this particular painting just follow the direct link at the end of this post. Wow! Jens Voigt, at the end of his career, is the new holder of the Hour Record. He covered 51.115 kilometers in one hour. He managed to cover one and a quarter kilometers more than the previous record. With the new record, he has ensure that his name will appear in a very important list of impressive men on two wheels. He accomplished this feet the day after he turned 43 years old. This is a small original watercolor and ink painting that is available through my artist website at www.greigleach.com. To purchase this particular painting, just follow the direct link at the end of this post. Jens Voigt, as he reached the final fifteen minutes of his effort, actually began to turn in even faster laps. He, and his coaches, had worked out that he needed to keep turning laps under 18 seconds for the total 199 laps it would take to tie the record. With the hour almost over, he had sped up from 17.5 seconds to a couple that were less than 17. After the very first lap, that included getting the single big gear to turn over, he never once went over 17.9 seconds with most laps logging in below 17.5. Not bad for the old man of our beloved sport! This is a small original watercolor and ink painting that is available through my artist website at www.greigleach.com. To purchase this particular painting, just follow the direct link at the end of this post. Voigt was riding solid on the bike, turning in laps under 18 seconds, the magic number that would lead him to success. When in the peloton, he is a rider known for fighting his machine and himself, trying to get every second out of the cranks. Today he was rock solid in his tuck, laser focused on holding a clean line and a perfect aerodynamic tuck. At 15 minutes into the effort, he had already picked up 15 seconds on the existing record, barring having gone out to hard at the start, he was on his way. This is an original small watercolor and ink painting that is available through my artist website at www.greigleach.com. To purchase this painting, just follow the direct link at the end of this post. International shipping is available. Jens Voigt, not one to go quietly into the night, set out today to set a new Hour Record in the National Velodrome in Switzerland. Voigt has raced his last road race earlier this year in the USA Pro Challenge in Colorado, narrowly missing a stage win in two different break aways on two different stages in the race. Knowing the spirit of the oldest man in the 101st Tour de France, it should come as no surprise that he hoped to end his professional racing career on a high note. This is an original watercolor and ink small painting created using Yarka St. Petersburg watercolors and Steve Quiller brushes from www.richesonart.com. In addition the painting is available through my artist website at www.greigleach.com, with international shipping available. To purchase this particular painting, just follow the direct link at the end of this post.